Want to ace your DMV license exam? The New York Department of Motor Vehicles (DMV) provides various publications to help drivers, including the driver's manual, commercial driver's manual, and motorcycle handbook. If you're interested in the state's traffic laws, read the New York Vehicle Code. The state's DMV driving manuals are an invaluable resource for new and experienced drivers alike. On this page, you'll find links to the various DMV handbooks and driving manuals designed to help you get on the road safely in New York. Applying for a New York driver's license. Intersections, turns, and road signals. The online version of the driving manual includes interactive quizzes at end of every chapter. Try an Online Practice Test! 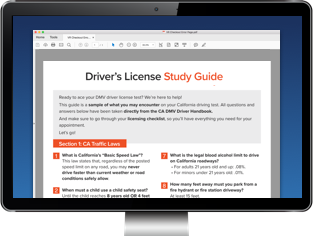 When preparing for the written exam, the NY DMV manual is a great place to start, but we suggest finishing with an online practice test from our approved partner. With questions drawn from past exams, you can refresh and retake your practice test as many times as you need to feel ultra prepared for your written licensing exam. Getting a NY motorcycle license. In addition to reading the motorcycle driving manual, you can take an online practice test to make sure you're ready for the DMV exam. How to apply for a New York CDL. In addition studying the CDL driving manual, take an online practice test to prepare for the CDL knowledge exam. The New York driver handbook is not the only helpful resource available to you. Browse through the New York Vehicle Code for details about laws related to driving in New York, such as licensing, registration, vehicle equipment, and safe driving. This will help supplement the information you find in the DMV handbook.